I love Back to the Future and I love Minimates, so when DST announced that they had rights to the franchise I was just the happiest boy ever. The Kubricks were great but there is something about the Minimate format that I knew would be a perfect match to BTTF (the key is bright colors: Minimates do really well with bright colors and "fun" costumes [another reason we're dying for Bill and Ted's Bogus Journey Minimates!] so the 2015 costumes in particularly would look great). My mind was set all aflutter with possible two-pack lineups, what could be the variant/s, and so on. Much to my chagrin, though, DST unveiled a four-pack. Not a bad thing, but a clear indication that they weren't really passionate about this property. Basically, whenever they launch a line in a four-pack (and remember this was before Toys Я Us was carrying anything other than Marvel and thusly before the success of Ghostbusters and The Walking Dead), it means DST wasn't really looking forward to the life of the line, but simply taking things casually one release at a time - something that came back to bite them in the derriere on all subsequent releases in this line. But nevertheless, the set for Back to the Future (Part 1) was unveiled and fans rejoiced - finally BttF figures/characters available in America (at reasonable prices)! This set was released in fall 2007 during a very strange time for Diamond Select. They were reaching out and getting a very wide array of licenses for Minimates, some very cool and some that just didn't really match the format. They were also making a lot of weird choices in character selection with Marvel and then in BTTF. Now, there is a lot of theories in the world of character and costume selection and during this period DST was going with the "representive" format rather than the "theme" format. I am a "theme" format fan and from what I see most other collectors are too - we want to build teams, complete scenes, that sort of thing. So why DST chose these costumes is beyond me, and was another concerning prophet for how the line would unroll. 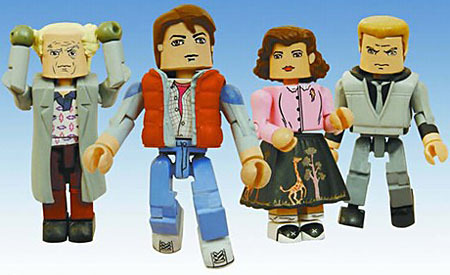 BTTF is great for toys because not only does each film have iconic scenes but multiple time periods, so there is a lot to choose from. And these figures certainly favor the latter aspect. 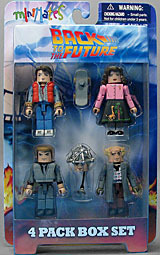 We have "signature" Marty McFly (based on the skateboard accessory we can ostenibly conclude he is Original 1985 Marty), Lorraine Baines in her giraffe skirt from BTTF II, Biff Tannen from the "Enchantment Under the Sea" dance, and Doc Brown from the Clocktower/Lightning-strike scene. With the exception of "signature" Marty and "clocktower" Doc, none of these characters ever interact with each other in these costumes. So right off the bat, the display is a weird one. 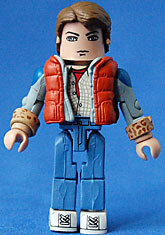 The most obvious and likely choice of any costume in the entire franchise is "signature" Marty as seen at the beginning and end of the first film. This is one of those "perfect" costumes that somehow flows with the actor and matches the character so effortlessly that this is the costume we all think of first when we hear the name "Marty McFly" even though it doesn't have that much screen time across the whole trilogy. Fortunately, DST captures it perfectly! The jean jacket has the two-tone denim look and even the animal-print interior visible on the rolled up sleeves. The jackest and famous vest are a seperate piece over the torso, which has the half-buttoned shirt over the maroon tee painted on. The face has a more cartoonish feel to the eyes than most Minimates but it still captures the look of Michael J. Fox well - this is definitely Marty McFly. 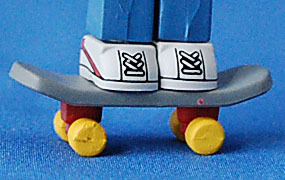 He also comes with one of the two accessories of the set - a skateboard. A simple peice that is definitely not the wooden scooter from the famous scene in '55, it has rolling wheels and a peg for the foot. How many times do fans ask "when are you going to complete the _____ team" of superheroes? Films are exactly the same thing. We buy these toys to rememeber and relive the moments we love. A complete "Jim Lee X-Men" reminds us of our youth, a complete Star Trek bridge crew gives us a hold on the endearing character dynamics and interplay, a surfeit of cantina aliens let us join Luke in Mos Eisley. By giving us a selection of costumes from different scenes its as if we're getting a superhero team with each character from a different decade. While the characters are true to the source material the costumes lack any sense of cohesion and we lose that tangible sense of familiarity that draws us to these collectibles in the first place. 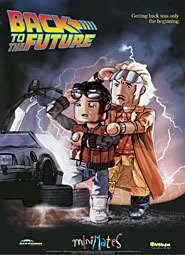 It's this disconnect that would ultimately doom the BTTF Minimates and keep the line from running as long as it could or should have, and while this mishmash of themes is far more noticeable in each subsequent release it is important to note that it was present even from the beginning. 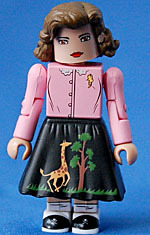 Lorraine comes in her giraffe skirt from the second movie [I'll just bet she does! --ed. ], specifically the scene when Biff, once more tries to get Lorraine to join him at the Enchantment Under the Sea Dance right before meeting Old Biff. It's an odd choice considering this is for the first film, but I can kind of understand the thought process since the giraffes make it more visually interesting than her other '50s outfits. Still though, it's a very specific costume that doesn't go with any of the others in this set. It would have been neat if she came with the box holding her dress for the dance in it too, but it's not as if it's sorely missed. Similarly, we can accept the choice of Biff's costume, in general he's just a guy in a monochromatic shirt and jeans, so the decision was certainly motivated by giving him a bit more visual "pizzazz." The problem though, is that the coloring is still bland and doesn't really pop out so he's kind of a forgetable figure. I can only hope they knew they would be completing the Enchantment Under the Sea theme through the two-packs and didn't mind breaking up the theme but he just feels out of place here with no other EUtS-specific characters (of BttF II's "Spy Marty"). I must also say that Biff's likeness is my least favorite of the batch. Tom Wilson must just have hard-to-capture eyes or something cause this guy could be just about anybody. If DST had to do four-packs, Biff is a perfect example of how the BTTF franchise is rife with foursomes: why not do a set of Biff and his three goons? Or of Griff and his three goons? Or of Buford and his three goons? It's right there for the taking! Or how about the four major teen characters at the dance? And so on. Instead of looking at those opportunities, DST seemingly decided that each film would only get one four-pack with a couple afterthought-ish exclusives. With that mentality, the line was doomed to fail because they let arbitrary confines dictate theme and scene-building. 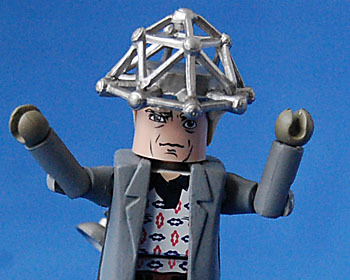 Finally we have the beloved "wild-eyed scientist" Doctor Emmet L. Brown. 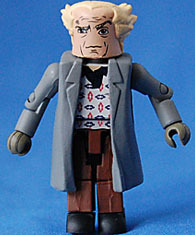 Doc is wearing his outfit from the clocktower sequence, during which he sends Marty... back to the future. A year or two later this is the kind of figure that would have come with alternate arms so that you create coat-on and coat-off Doc, but no such luck here. It's kind of neat, though, because the three Doc Brown Minimates are all wearing overcoats, so there is some nice continuity there I suppose. 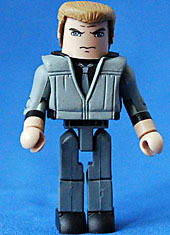 Doc also suffers from a fortunately short-lived misconception in Minimate design - a uniquely sculpted head. That is to say, his hair is permanently sculpted onto his head and indeed there is no standard Minimate head underneath - it's just one piece. While this was semi-plausible for the Hannibal Lecter figure and his receding hairline, it's just unnecessary here. Plus, any step further away for the core Minimate body is a step in the wrong direction. He also comes with one of the most frustrating accessories in all of Minimate-dom: an alternate head that does have a removable hairpiece, but that piece is of the mind reading helmet! Whaaaaaa...? For a long time DST had this terrible and fundamental misunderstanding of variants with their Minimates. Each series of three three-packs would include a rare variant set in which one figure would have an alternate deco or even character (same thing they still do today), but what went horribly wrong was there was no change to the other figure, nor were they some sort of army-builder or figure with alternate looks. This often lead to inane and useless doubles. We were thus forced to have two Sareks, two Chekovs, two Doc Cottals and so on. Fortunately they've fixed this in the intervening years but back in the day it was a really aggravating part of collecting and Doc's alternate head here continues that tradition. If you're like me and want to have "everything" on display then you had to spend another 20 bucks and get stuck with not one but three doubled figures and then you could have Doc in the helmet on display but even then he would be wearing a completely incorrect costume! I'm sure that the designers thought this would be a fun accessory from a classic scene but in reality all it is is sand in the fans' eyes. As if DST produced the saucer section from the Enterprise but never the rest of the ship. And just to be really annoying, the helmet lacks paint to create the glowing lights at the nodes and, even worse, the "cable" to the forehead suction cup is way too short for Doc to even hold, let alone touch to another figure. It's just a totally useless piece of plastic and a waste of their time and money. Those production costs should have gone into a more worthwhile accessory like the video camera, or alternate arms for Doc and Marty, or Einstein the dog, or literally any number of things that would have helped our collection rather than confound it.